My cat id 18 and has always been sick on a regular basis. Some food are better than others but the cheap ones were the worst. She loves this Cosma Nature and does not leave any in the bowl and only sick on the odd occasion now. I add a supplement as this is a complementary food and as she has gone off dried food supplements probably because her teeth are causing some problems. This is fabulous food, very healthy, a very high content of meat. The cat loves it. When I got my cat she had been fed cheap supermarket dry food all her life (which, when I tried to give some, she didn't see interested in). I changed her to Orijens dry food and cosma wet food from Zooplus and she went bananas for it. She's gone from being a furry bag of bones, to a healthy weight for her size. Tuna and shrimp is her absolute favourite. Happy cat = happy Mum. All the different kinds are gladly eaten. They leave nothing in the bowl. Looks yummy and smells good. It's on a par with Applaws, just a bit cheaper! I had to look for another wet food for my two BSH when Iams changed their recipe, upsetting one cat's stomach terribly. The cats only get a little wet food as their main diet is RC dry food. They've gone mad for the Cosma Nature. So yes, it's not cheap but there's no waste as every bit is licked up. It smells amazing and looks like fresh meat and fish. Two more Pros to this food; boy cat doesn't have a runny bum anymore and girl cat doesn't over-eat then vomit. Highly recommended. We took in an undernourished and poorly cared for cat (thin and fatty coat) and started feeding her Cosma Nature from day one. Within three days you could already see her improving - much healthier fur and her sides look much less sunken now. Highly recommended! Ever since feeding this to my cat during one of her hunger strikes, now it's always in the bowl. This food is a supplementary food with no additives, it looks yummy, almost as if you could eat it yourself. And it looks yummy. Thumbs and paws up. that this was the culprit that made my cats poo stink! This is one of three foods they are fed per day.They have had this for the past year and then all of a sudden started turnng their nose up. Recently tried a different wet food and no more smelly poos. Apart from that cant fault it. Good quality, almost looks good enough for humans to eat. My two mixed breed cats are very fussy but love cosma in all its varieties. They literally lick the plates clean every time I give them this brand. The price of this product is very reasonable in comparison to other brands offering similar. I have been ordering this for a while now in the 140g can size which feeds my cat two meals. He can't get enough of all the different varieties and he is quite a fussy cat, so this food makes us both happy. It's a shame this isn't a complete food but food of this type rarely is. Nice tuna - not all dark meat, and high meat content. Really great for fussy cats! My cat is not only a fussy eater, he also suffers from food allergies. 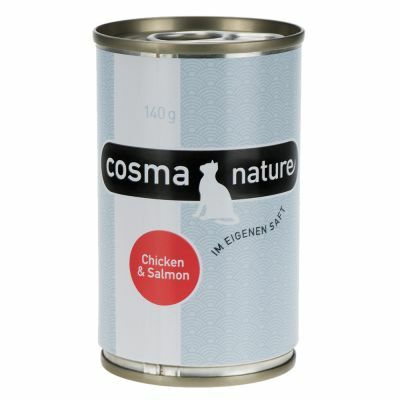 Discovering Cosma Nature Chicken Breast was therefore a great relief for us since Georgie not only licks the bowl clean, afterwards there is no scratching or overgrooming. Very pleased with this product. Bought the trial pack for my 2 year old and he absolutely loves it, especially the chicken breast. Although, he is not a fussy eater this (and Cosma) is the only high meat content food he will eat. More expensive than low meat versions, but great as a treat. Good for my fussy cats! Got this as a free gift with a previous order and my cats loved it so have bought again. I have 2 fussy cats but as soon as this is put down it's gone! Would like it a little cheaper but it's worth if if they enjoy it so much. My 9 month old ragdoll loves this, its up there with applaws and almo nature but much cheaper. My cat loves this canned food! Always licks his bowl clean. Very reasonably priced and correct size tin for one individual meal. My cats really love this brand of cat food. The quality is high and you can identify the different flavours as they actually contain real ingredients!! Would definitely buy again!!! All 4 of my cats love Costa nature - all the flavours even my extra fussy boy! The bowls are always licked clean! The food is good quality and very reasonably priced! It's up there with the more expensive products of a similar composition! Will continue to repurchase for sure! My 2 fussy felines adore this and it's a guaranteed success at meal times. And fab value and points as a added bonus on the reward scheme. My cats love this food as you can see it's mostly all meat/fish and good quality. My cats love this food. They have a variety of cosma nature, but this one looks very good in the tin and the smell get them all mewing ñ. My cat, who admittedly is a fussy eater, wouldn't even sniff this food. I gave it to a friend's cat, who ate it all up. Great Addition to Cosma range. I have two fussy Ragdolls who prefer dry food but I try to keep a bit of wet food in their diet to mix it up a little for them. I had a trial pack of these as the kitties had stopped eating Cosma Thai and won't even eat the gold or standard range anymore. The food is almost identical to the other range and is the same high quality, almost human consumption friendly. The meat (or fish) is nice and chunky, more like tuna flakes humans eat. It doesn't smell bad and my kitties ate it happily. I'd happily purchase again, the whole Cosma range is good quality food at reasonable prices. I ordered the trial pack using my reward points and couldn't be happier. Two of our cats have sensitive stomachs and have a limited choice of wet food. They have been absolutely fine with these and have eaten every scrap. Fantastic!! This food is just like shredded chicken in a can. I have just used it to hide medicine in and the cat loved it so much she didn't spot a single bit. It's also great to inspire fussy eaters. I have been trying it out on my reluctant eaters. It's a food that I will always keep in the cupboard for emergencies. A great healthy, natural food for cats! My cat has only had Applaws because I wanted to give her food without any nasty additives and with very high meat content. I wanted to try the Cosma Nature as it seemed the content was very similar but it was cheaper. The cat was not dissappointed, there is no difference in her eating habits with this or Applaws. She especially LOVED the salmon flavour. The food looks and smells very natural. Highly recommeneded. This is great value food, comparable to the Almo Nature brand, the chicken fillet flavour went down a treat with my cat, he loves the Almo stuff which is much more expensive but I thought I'd try him on something new and this was perfect, it looks and smells exactly the same but is a couple of quid a kilogram cheaper. Buying some more now. Got some of these as a freebie with my cat litter and gave them to my friend as my cat has dry food only. Her cat loved them, absolutely wolfed them down!